Our rugged off-road trailers can take a beating — and keep the adventures coming. When you’re ready for something beyond the beaten path, bring one of these trailers with you. 5’ x 8’ 1,400 lb. The Scout is our lightest off-road trailer, with a dry weight under 1,500 lb. It comes standard with the 1-Tonne Timbren Axle-Less suspension system and a Lock ‘N’ Roll fully articulating hitch, plus black steel wheels wrapped with 30x9.5R15 tires. The Jeep-style fenders allow additional clearance for larger, more aggressive tires. The Scout has a lighter suspension and 2″ x 2″ tube-frame construction to achieve a lighter, more economical weight. Like our Recon teardrop, the Scout has steel wall support tabs to provide strength for your off-road adventures. On top of these unique features, the Scout also has many of the excellent standard features available on all of our teardrops. 5’ x 9’ 1,700 lb. The Ranger is our newest off-road trailer and is built to withstand the most rugged roads. The Ranger is built on a 5’ X 9’ frame and has our traditional curved front-end design. This trailer includes many off-road options, and our TDNW custom step-side fender is a standard feature. The Ranger is large enough to install the Dometic refrigerator lengthwise in the galley, and it has enough room to install a Propex heater -- while still providing ample cabinetry. If you’re looking for an off-road trailer built with tons of storage options and outstanding off-road capabilities, the Ranger has it all. Check out our trailer builder for more options. 5’ x 8.5’ 1,650 lb. 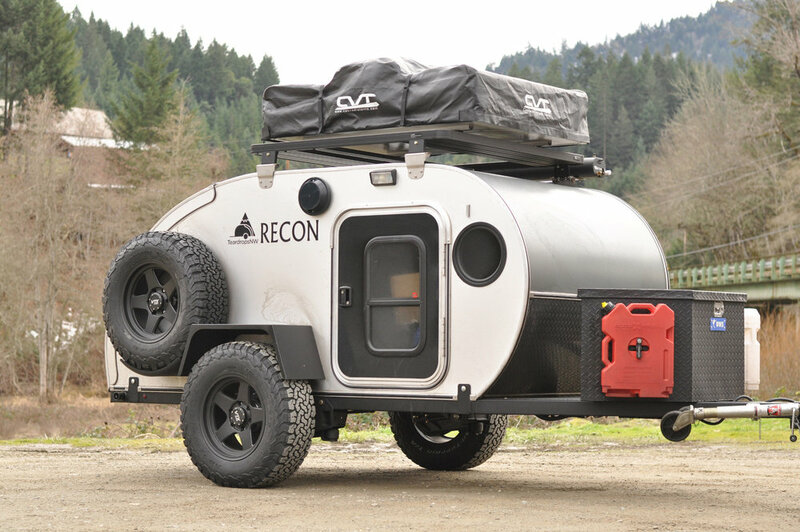 The Recon is based on our Sojourn highway trailer chassis. A tough 2 x 3 fully boxed steel frame will take just about anything you can throw at it. Along with our teardrops’ standard features, the Recon comes with the Timbren Axle-Less suspension system. The frame also has additional wall supports to handle off-road duties. The Recon includes the Lock ‘N’ Roll hitch system that allows full articulation and smooth towing capability. The Jeep-style fenders allow additional clearance for larger, more aggressive tires. If you’re looking for an off-road teardrop that can handle more than an average campground, the Recon is for you! 5’ x 10’ 1,750 lb. The Commander is our largest teardrop trailer. Even at this length and with the heaviest dry weight of all our trailers, the Commander can still be towed by a majority of vehicles on the road. Like our Recon, the Commander also comes standard with a 2” x 3” fully boxed steel frame. The size guarantees a galley even a professional chef would envy. The Commander can be equipped with ample storage, a 53-quart Dometic refrigerator/freezer, and a large stove drawer. Check out our trailer builder for more options.